Volvo 240 models headlamps came from the factory running all the power to the headlight through the switch in the dash. This is not a great way to do things and is asking a switch to carry a load it is not built to handle long term. The result in my experience is a larger than desired voltage drop from battery to lights (dim headlights) and meltage issues over longer periods in the switch and connector. The idea with what I'm writing here is a super simple way to improve the circuit with minimal wiring changes and just a couple bucks in parts. A cheap mod that provides less voltage drop to the lights (brighter headlights) and no more melty switches. The entire gist of this is that we're hijacking the power wire between the headlamp switch and the headlamp step relay on the inner fender next to the battery. Instead we're going to use that power out of the switch to trigger a relay which then sends the power to the step relay instead. Really, the only parts you'll need to buy is a SPST (single pole single throw) relay and a fuse/holder. I used a basic 40amp relay from Radio Shack. It cost all of $5.00 and you can find it HERE. For the fuse you can use whatever you want. I'd recommend going for something waterproof since you'll likely be installing this in the engine bay... I used THIS ONE. Last edited by Cameron; 01-17-2012 at 02:19 PM.. Thanks for relay link! I tend to go to automotive supply stores and then look for something that's workable; this one will also work for my upcoming fuel pump upgrade!! Yup, certainly will. I used the same ones for triggering the ECU, Fuel pumps and coils with the LINK G3 ems on my 16v wagon. Never a problem with them. I think they carry 50amp rated ones too if you want a slightly burlier one and they're still under $10.00 each. 40A should do - if that circuit sees more than 11-12A something bigger is wrong anyhow! Very true! Should be using a lower amp fuse for power than what the relay is rated for anyway as well. If I remember correctly the later cars have this setup from the factory. Starting sometime around 87? I think the relay is mounted under the dash somewhere. I did it to my 242 years ago when I changed to the later headlight switch. Mounted the relay next to the Lambda Sond relay on the inner fender. Absolutely a worthwhile upgrade for the minimal effort involved. I think you are right about that -- don't know when Volvo added it, but late 80s sounds right from my foggy memory banks. I've seen reference of it being located in the driver side footwell on the firewall but never seen anything about when that actually happened. I pretty much deal exclusively in pre '86 240s so I haven't had the depth of experience in "new" 240s like I have in the older ones. I'll be doing this the next time I head home. I narrowly missed having a 240 "Char-Grilled Edition" because of an overloaded 30-year-old switch. Edit// that grab handle shipped out today. It should be in your hands by week's end. I did the Stern upgrade on mine years ago. 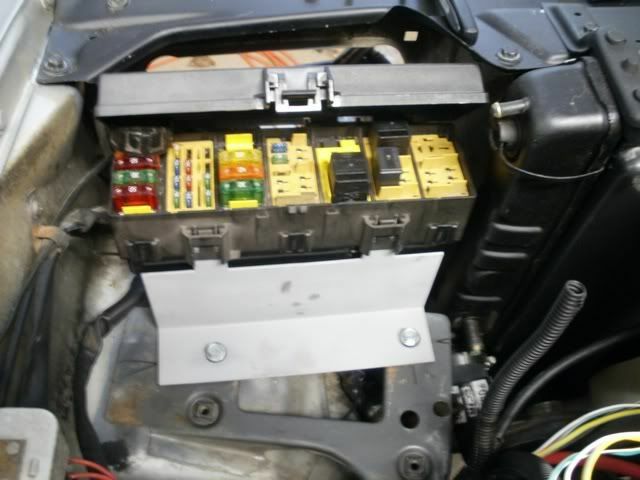 2 relays per side (1 for lowbeam, 1 for highbeam circuit), 10 gauge wire. Virtually no current through stock switches/harness and no (measurable) drop between alt and bulb. With 100w bulbs on highbeams - it gives good light. Great idea! That also gives me another use for several unused relay sockets located up front. Connecting to the headlight wires at the front to operate the relays would bypass the bulb failure device but I think I can deal with a head light out. I spliced in the later style switch and relay on my early car while going through the wiring harness. Prevents accidentally leaving the headlights on too. Even those tend to melt the relay holder and terminal around the "30" supply, so adding the relays (like Daniel Stern sells) is still a good idea to remove the load from the factory wiring. 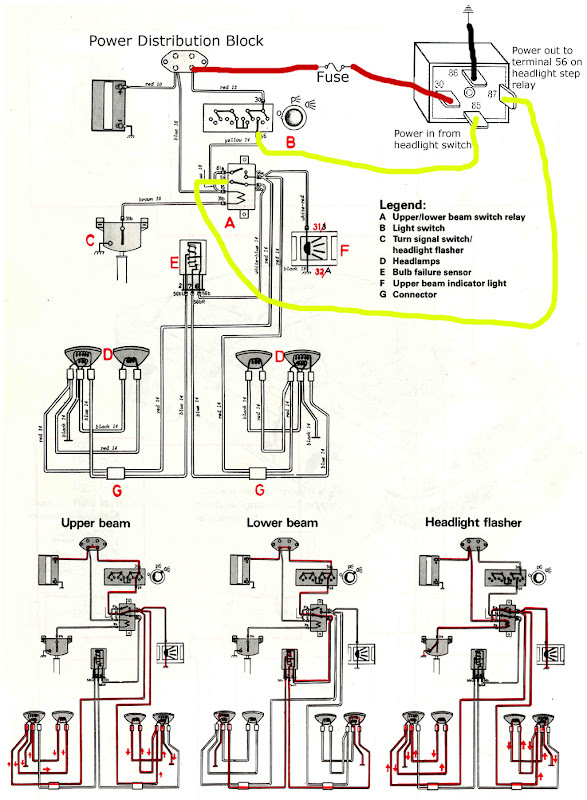 FWIW/FYI....On the later 240s(86-93), the "Main Relay" as the parts book calls it, which is the mod you've done...was moved around a little in the cabin area. On my 1986 245 it was "under DS carpet, under the brake pedal lever area" on auto trans. My 91 244 it's behind the center console "behind the little tray area". When you say 'Reroute a couple of wires' do you mean existion or new? With the new wires and relay installed is there any old wiring that needs to be disconnected? I have dim high beam on my 242DL 1984. I'd like to report that this little modification was well worth the effort. I ended up making a little octopus-like critter with the relay as the body with a few short wires hanging off of it. The longest wire is only about 8 inches long. I mounted the relay beside the dimmer relay and just unplugged and replugged wires. My lights are much brighter now.